One Direction You & I sold under the name of a popular British music band One Direction. One Direction You & I 100ml. Eau De Parfum is the same feat famous musical groups. Name of smell bears their favorite songs. It is a combination of freshness and sweet flavor that will make you a lady properly. Aromatic spell full of diversity and effervescence. 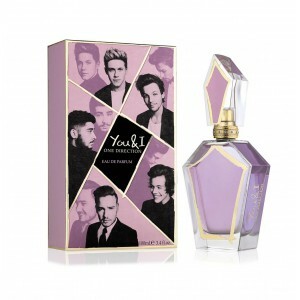 One Direction You and I Parfum for women who have fallen in love with floral and fruit ingredients. The dominant feature of this essence is definitely a peony in connection with citrus and sandalwood. Whole evoking a feeling of joy and confidence. With this option, you can indeed live for a day or any social event. Pink vial of scented water for women One Direction You And I is overflowing with creativity and imagination. The form of the crystal suggests that you can expect a real gem fragrant. Experience the sounds of the famous song transformed into a intoxicating scent with which frame the issue in a romantic and refreshing mist. The new fragrance You & I by well-known British band One Direction - this fruity-floral symphony, warmed by a gentle praline and deep musk. Base notes of citrus fruits with hints of peach flowers, osmanthus and juicy mango form the basis of this stylish perfume. The loop discern subtle chords orchid and peony softened with warm notes of praline and sandal wood. Musk accent makes the composition of deep and sensual, emphasizing all the colors of the tender and romantic fragrance. Introduced in the late summer of 2014, he embodied the sensuality, tenderness and boldness inherent in young love, covered by a storm of emotions, brightness, passion and an irresistible attraction, characteristic of all young and innocent natures. This composition is suitable for young boys and girls reflect their individuality and emphasize style, fill each day with new feelings and allow yourself to feel the center of the universe, whose name is Love.